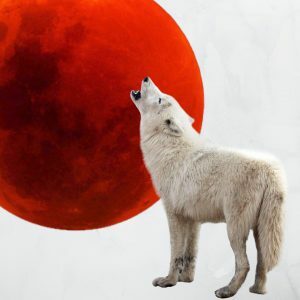 This coming Monday the 21st of January we are going to witness a Super Blood Wolf Full Moon. Say what? Yes, a Super Blood Wolf Full Moon. ‘Super’ because this full moon is closer to the earth in her orbit then usual and thus appearing larger. ‘Blood’ because of total Lunar Eclipse making the moon appear red through the sunlight that is filtered by the earth’s atmosphere. And ‘Wolf’ because the Native Americans would refer to this full moon in the midst of winter as a wolf moon since there are a lot of hungry wolfs going round, howling to the full moon extra passionately by the lack of food. Full moons are always beautiful moments to make some extra time to contemplate and meditate since she is shedding her light on what is hidden in our subconsciousness, often leading towards more emotional behaviour. With this Total Lunar Eclipse it is extra important to bathe in her light consciously since it is said that the effects of a total eclipse last very long, about a month per hour of the eclipse, which could result in several months of more ‘lunatic’ behaviour. 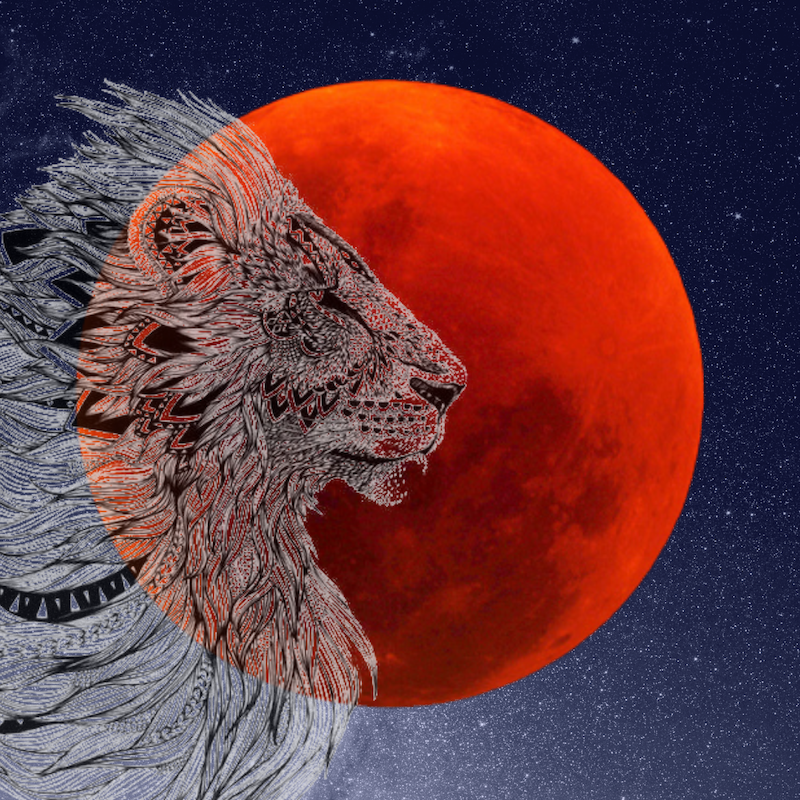 The Total Lunar Eclipse is happening in the star sign of Leo. This majestic animal is inviting you to raise your head, shake your manes and let out a big roar. No matter where you are in your life right now, this is a moment to celebrate and honor your victories, big or small, in your growth and spiritual progress. Take a moment to see the steps you have made over the past years. Raise your head, shake your manes and let out a big roar to release your emotional burden, old pain and wounds you no longer wish to carry with you. With your majestic roar, hand it over to the Universe and let the Divine take care of it. Be brave and courageous like a Lion and be willing to let it go. Raise your head, shake your manes and let out a big roar to let the world hear your voice. Step into the light and share your God given talents to make this world a warmer, brighter and more loving place for all sentient beings, release the leader within you, it’s time. This Monday the 21st of January we are sharing a special Live Online Session with Kundalini Yoga & Meditation working with this auspicious eclipse energy to help you honor, release and level up your game. It’s going to be a powerful activation you can join from anywhere in the world, a possibility to clear a lot of emotional baggage, clearing your inner world and allowing you to see things from a new de-cluttered perspective. The livestream will launch at 8.30 PM CET and replay will be available. 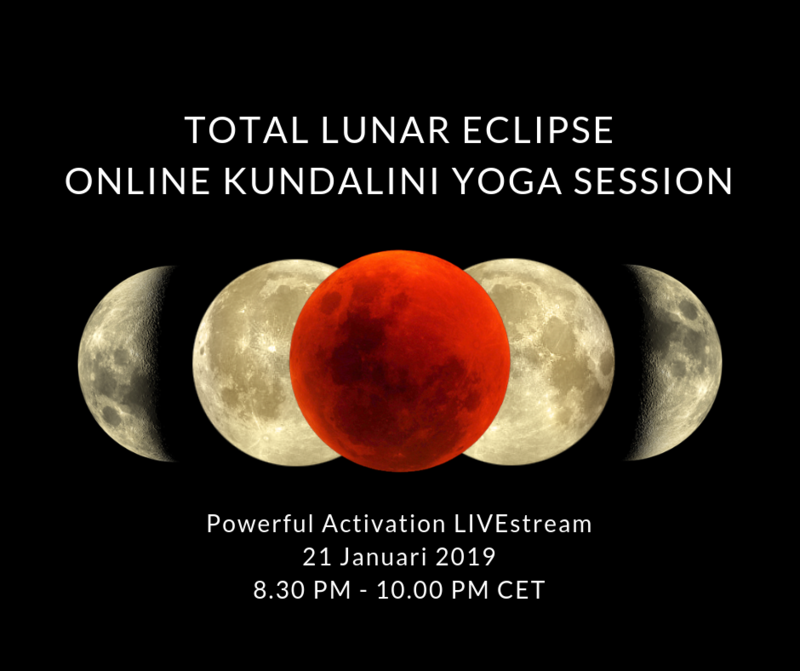 You are most welcome to join the Total Lunar Eclipse – Live Online Session on Monday the 21st of January at 8.30 PM CET. This session will be a powerful activation working with the energy of this Full Moon offering you a full Kriya (yoga set), relaxation and a meditation, all tuned into the moment to give you the best experience. Looking forward to serve you and to share this sacred technology. Let’s raise our heads, shake our manes and let out a big roar together! See you Monday the 21st!